We went for a weekend to Balaton and when we arrived to the campside we finally wanted to have a shower (it was 35°C outside). But in the shower was suprisingly only one faucet – cold water. One week later Evit told me that she still has cold shower in the morning and if i also want to try it. In October we found out about he trainings of a Polar Bear club so we went to see it. With two children it’s difficult to come on time but we didn’t realize that swimming in cold water takes only couple of minutes and if we come half an hour later we may not find anybody there. Fortunately the last man was still in water and he gave us courage. 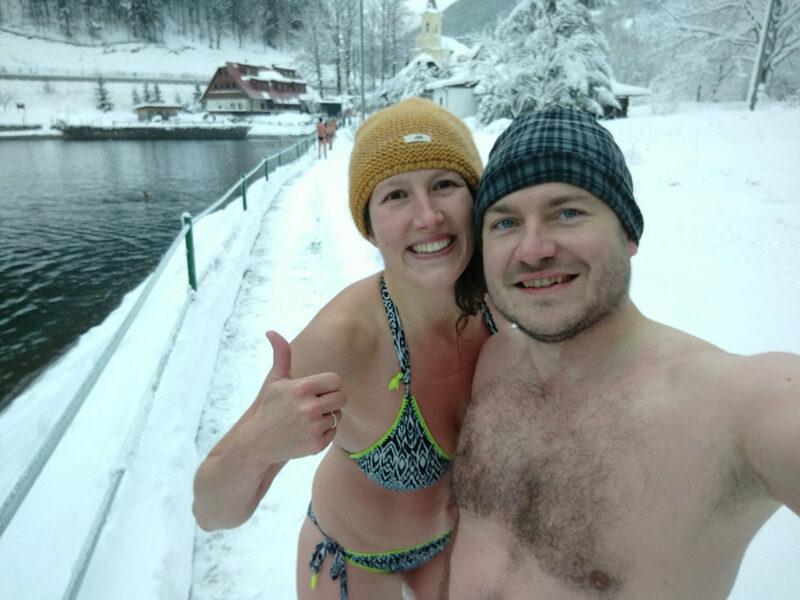 The first dip in cold water (around 8°C) was one minute long and it was a very intense experience – those 60 seconds lasted very long and it was freaking cold, breathing was difficult but the feeling afterward that we could do it was amazing! So we started to swim outside every Sunday. The water was getting colder and colder but we were able to stay in it longer (10min). We found out that the freezing sensation lasts only the first minute and that at some point even a warm sansation comes. 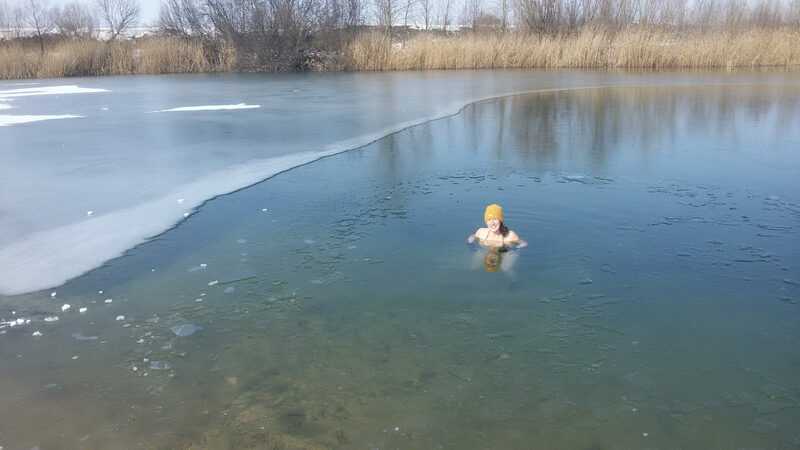 Later in winter we were swimming at Motyčky lake which is eally luxirious area for this type o activity, because the water doen’t freeze and it’s still possible to swim there even in really cold weather. We were around 50 swimmers there normally and it looked like it’s a hermal bath from distance. 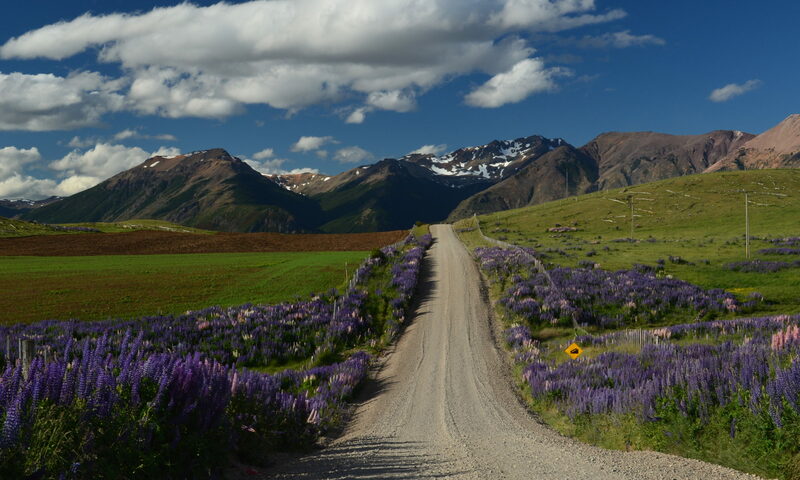 I understand the drivers who were horning because such a view is definitely surprising to a passer-by. Even more surprised looks had the skiers at Šachtičky because the ski slope is just next to a lake where we were bathing in a hole in ice. We got to know many great people among the Polar Bears club BB-ZV. 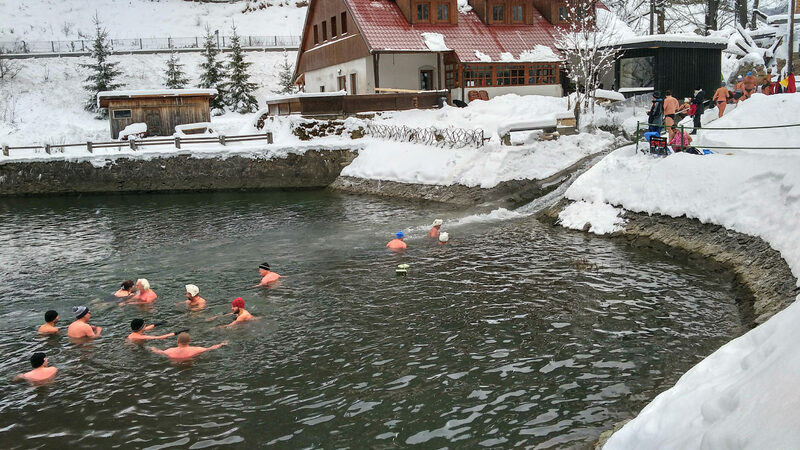 We were not always able attend the official “trainings” but suitable waters exist at many locations and also some of our friends like this activity (actually surprisingly many people do it) – so we were ice water swimming at various places and we missed maybe 2 weeks in whole winter. We always took also our children with us. Kolko was waiting in the car seat next to the water but we had to keep an eye on Janko who was running around – fortunately without any accident and when he wanted to join us it was enough to dip his feet into the water and he changed his mind. Health benefits – it’s a fact that the winter swimmers are less sick and the cold water has posiive effects on the cardio-vascular system. Great feeling – always full of endorphins with a big smile on the face after getting out of the water (even when shaking from cold the next hour). Before we couldn’t even imagine it’s possible to get to such a freezing cold water so our limits were shifted a lot. Perfect people – all the people who like the cold water think positive, smile a lot, make jokes – we feel great among them. Sunday activity – these “trainings” forced us to go out. Sometimes we were really lazy but afterwards we were really happy we went. We discovered lakes near the town – we thought that the nearest water for swimming is 45 minutes far, but suddenly there were many just in couple minutes distance. 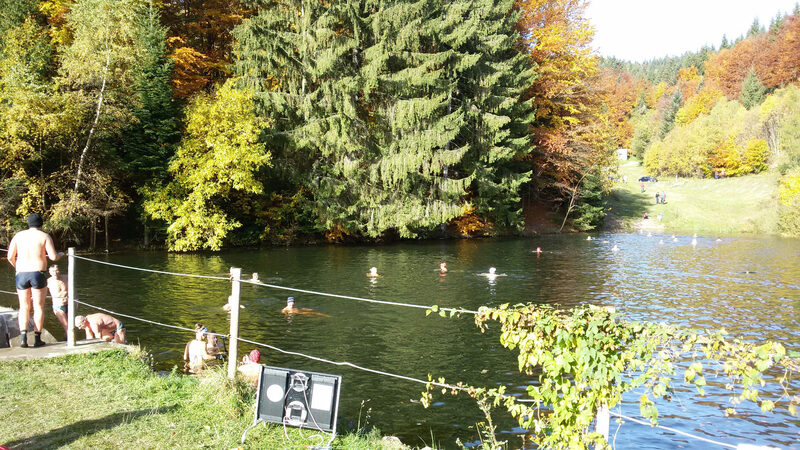 In winter it’s OK to swim in almost every water but some of them are good to swim in summer too. 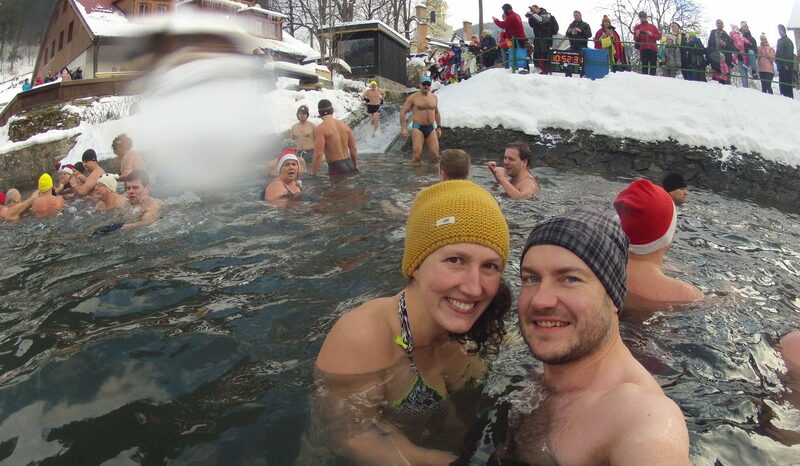 There are many pages with info about winter swimming, just google it. And you can watch a good movie about Winter swimming.